Non-ribosomal peptide antibiotics, including polymyxin, vancomycin, and teixobactin, most of which contain D-amino acids, are highly effective against multidrug-resistant bacteria. However, overusing antibiotics while ignoring the risk of resistance arising has inexorably led to widespread emergence of resistant bacteria. Elucidating the little known mechanisms of resistance to peptide antibiotics is critical when implementing peptide antibiotics and would improve effectively improve efficiency. In a recent study, a group of scientists from the Hong Kong University of Science and Technology reveals both the widespread distribution and broad-spectrum resistance potential of D-stereospecific peptidases, providing a potential early indicator of antibiotic resistance to non-ribosomal peptide antibiotics. Their findings were published in the journal Nature Chemical Biology on Feb 26, 2018(doi: 10.1038/s41589-018-0009-4). "We applied an approach to 5,585 complete bacterial genomes spanning the entire domain of bacteria," said Pei-Yuan Qian, chair professor of the Division of Life Science, HKUST, and lead author of the paper. "With subsequent chemical and enzymatic analyses, we demonstrated a mechanism of resistance toward non-ribosomal peptide antibiotics that is based on hydrolytic cleavage by D-stereo specific peptidases." 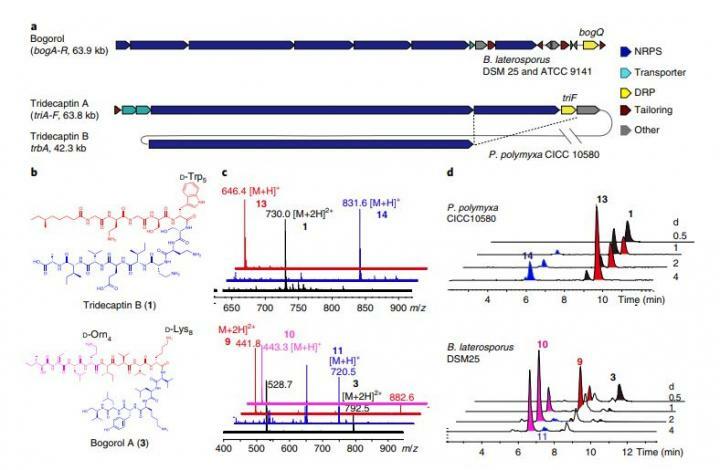 The team identified a family of D-stereospecific resistance peptidases (DRPs) that are phylogenetically widely distributed in nature. The finding DRPs was found to be involved in combating widely-distributed antibiotics containing D-aa for the survival of their host, which was experimentally validated by a combination of CRISPR/Cas9 based gene editing, chemical and enzymatic analyses.